It is not impossible corruption and organised crime to be bound in some way to the new rule of law mechanism the European Commission is preparing. 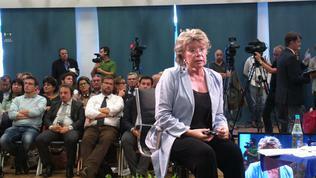 This is what Vice President Viviane Reding told euinside responding to the question whether the mechanism Jose Manuel Barroso announced during his annual state of the union address on September 11th could replace the Cooperation and Verification Mechanism with which Bulgaria and Romania joined the EU. Ms Reding gave a detailed background about the Bulgarian-Romanian mechanism, recalling that it was imposed because of the corruption and organised crime in Bulgaria and mainly only corruption in Romania - phenomena still not cured. Without saying it directly, but from the vice president's statement, who is responsible for justice, fundamental rights and citizenship, it became clear that Bulgaria and Romania are a separate category member states. The conclusion comes with the explanation which she gave about the common European mechanism, the only purpose of which is to ensure there is an early warning mechanism when the independence of the judiciary is harmed. The focus will be precisely on the freedom the courts have to rule without bias as well as on ensuring an independent supreme court that can "correct" errors at a lower level. This means that the mechanism that is currently worked upon will be entirely aimed at removing problems like those that emerged in Hungary and Romania where precisely the independence of their supreme courts (the constitutional court in Romania) were attacked. This is clearly seen in the grounds Ms Reding gave on September 4th at the Centre for European Policy Studies (CEPS) in Brussels about the upcoming proposal. In all statements related to the issue, only the examples of Hungary and Romania are quoted, not Bulgaria. It is still not clear when exactly will the Commission be ready with the proposals, but it is certain that there will be several options. Viviane Reding did not reject the possibility the two mechanisms to be in some way bound together, but underlined that the common European one has another purpose. Viviane Reding was in Trieste to take part in the first in its kind trans-border and multi-country dialogue with citizens from four countries - Italy, Austria, Slovenia and Croatia. The choice of town is not an accident because this is an assembly point of the German, Latin and Slav culture. In the more recent history Trieste was often a centre of the battle between the east and the west during the Cold War because it was one of the border points of the Iron Curtain, though one of the more leaking places given the a little more loose dictatorship the countries in former Yugoslavia had. Currently, there is again a process of activation of relations among the countries in the region. There already is readiness the trilateral summits between the leaders of Croatia, Slovenia and Austria and also between Croatia, Slovenia and Italy, to become regular. It is not impossible these summits to turn into quadrilateral with the ambition to coordinate better the four countries' positions in the EU, three of which are in the euro area. And there are problems to solve. One of them was raised by a citizen from Slovenia who reminded that there still is no lustration in his homeland and that communism is still prevailing. He asked Ms Reding what could she do to break this concrete brick wall of communism (after the analogy of Pink Floyd's wall, which Bulgarian protesters symbollically broke this summer). The response, however, hardly was satisfactory for the Slovene because it practically told him that patience is needed to resolve this issue and many efforts. Viviane Reding recalled that the foundations of today's EU were laid by six countries who then exited fresh from one of the most horrible historic events on the continent - World War II. Then what united them was their desire to work together so that they never forget. 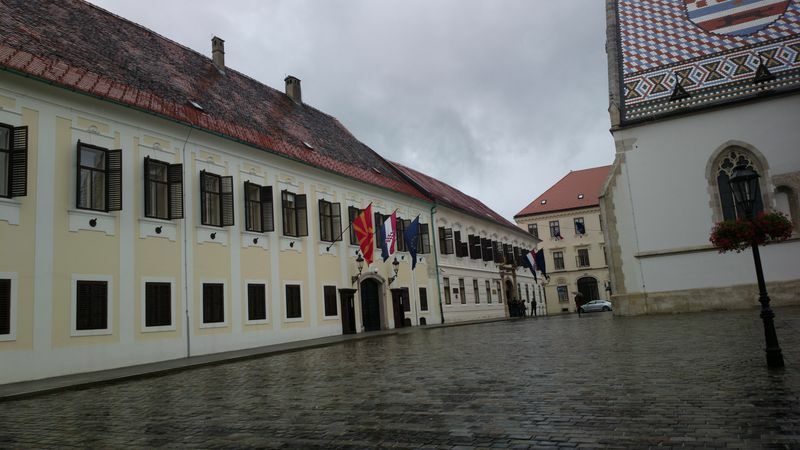 But the Slovene held on and afforded himself another question, although this was against the rules of the citizens' dialogue, whether the Commission could put pressure on the government to start putting a cross on the past by freezing the expected financial assistance. Viviane Reding said, though, not quite categorically, that financial assistance cannot be bound to resolving the problems with dictatorships from the past. But she, nonetheless, asked the Slovene to send her his questions. The Perkovic case - Croatia's past is persistently ringing? Slovenia is far from the only case where the past calls with a clear voice and states clearly that it is not gone and in some cases that it even does not have intention to leave, as in Bulgaria for instance. Croatia, which is EU's youngest member, is yet to come to terms with its own past - a process that does not seem to have started. The European Commission, however, will initiate [already has] sanctions against the country because of the famous "Perkovic amendment", which puts a time threshold for the implementation of European arrest warrants (EAW) - only for crimes committed after 2002. Many in Croatia, and not only, suggest that this amendment protects people like Josip Perkovic, a former officer with the Yugoslav secret service UDBA, sought in Germany for the murder of a Croatian citizen. The subject "Perkovic" was not raised during the dialogue in Trieste, but at a news conference afterwards. 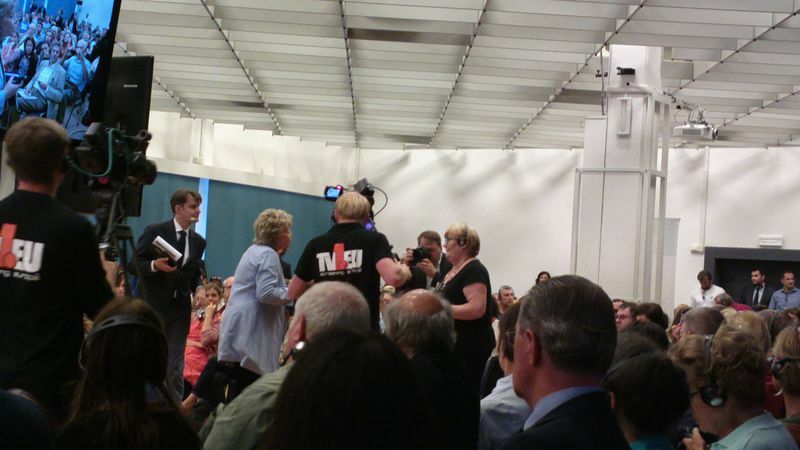 Ms Reding avoided the question to the last moment, but the persistence of Croatian media forced her to state directly that it was not simply about a violation of European law, but about the loss of confidence. She admitted that she felt betrayed by Croatia which she believed was moving in the right direction and for which she insisted the mechanism of Bulgaria and Romania not to be applied. But with the adoption of the Perkovic amendment, however, precisely three days before the accession Croatia downgraded itself into Bulgaria's and Romania's level - countries without authority, without trust and with many problems. Ms Reding said that last Friday she got the full backing of the Commission to initiate punitive actions. What will they be, however, is still not clear [at the time of translation of this text the College of Commissioners decided to introduce enhanced monitoring on Croatia and to suspend the Schengen Facility]. This automatically puts the country into the group of losers where Bulgaria and Romania are, moreover given the fact that Zagreb had the ambition to join the zone of European security two years after accession. 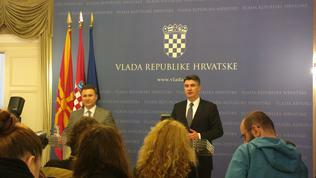 The Croatian premier, though, rejected any possibilities of sanctions and attacked Commissioner Reding directly. Zoran Milanovic not only did not demonstrate readiness to step back, but radicalised his talking. The conflict between Zagreb and Brussels is growing into an interpersonal brawl after the Croatian prime minister directly accused Ms Reding of working entirely for her seventh term in office. He again downsized the problem, saying that he was 99.9% sure that this was a domestic issue and no one else cared about it. Moreover, he attacked the media, too, recommending them to be more respectful and more critical because this was about a campaign of individuals, party opponents, who worked against Croatia. Milanovic also said that he was not concerned about sanctions because the truth was to come out. Croatia is not a bird reserve, but a state and I will not allow someone to wipe the floor with Croatia, the premier added at a joint news conference with his Macedonian counterpart Nikola Gruevski. After pointing out that Croatia supported entirely Macedonia to start accession negotiations with the EU and that too much time passed and the country should have been a member of NATO long ago, Milanovic explained that Zagreb will help its former Yugoslav mate. Macedonia has many problems which it has to resolve, a large part of which are related to justice and media independence. In this regard, the Croatian prime minster gave a good lesson to his Macedonian colleague about how should a firm hand be demonstrated both to Brussels and to all critics of the government. Do you hear me, Europe? This question was asked several years ago by Radoslaw Sikorski, the Polish prime minster, just before the Polish EU Council presidency. It was about Poland's desire for a Europeanisation of the foreign and defence policy. With the citizens' dialogue the Commission held 29 times so far all over EU, this question is asked by European citizens. In Trieste it became clear that 57% of some 470 people who voted believe that their voice is not heard in Europe. After two hours of a dialogue this did not change significantly - 56% continued to believe that their voice remains unheard in spite of the many questions asked. One of them, however, was a call for help by a woman from Rijeka who asked the vice president of the Commission to intervene so that corruption is rooted out from Croatia. Viviane Reding said what she told the Bulgarians as well. Corruption is cured from the bottom upward - by creating an environment that is intolerant to corruption. Rooting out corruption requires a change of mentality, demands transparency and accountability. This again is in the tier "do it yourselves" and may be one of the reasons for the persistent number of people who do not believe something depends on their voice. Paradoxically, however, 83% of the inhabitants of Italy, Slovenia, Austria and Croatia who took part said they wanted a deeper political union and 72 percent said they wanted the president of the European Commission to be directly elected by the citizens. This would probably grant greater legitimacy to the commissioners as well when they are involved in conflicts with prime minsters or presidents of the member states. The questions raised, the existing problems in many of the new member states clearly show that, indeed, it is necessary not only generations to change and thus the remnants of the past be cleared, but to systemically work to root out the harmful practises. The establishment of a common European mechanism to protect the rule of law is a step in the right direction. We should be careful, though, that this step is not too small and to find ourselves looking for another approach for those countries that have not yet turned the page of their history.